Type 2 diabetes statistics worldwide continue to mount to epidemic proportions. And it's fair to say that type 2 diabetes is now one of the most common chronic diseases around the globe. And if you've wondered just how many people are affected by it? These statistics will help showcase the full extent of what's occurring on a global scale. When you're finished reading, please share our infographic (below) to help inform others. Although most available statistics do not differentiate between type 1 and type 2 diabetes, according to the CDC, 90-95% of all cases of diabetes are type 2, though many stats state it is closer to 95%. Type 1 diabetes is much less common than type 2, making up 5% of all cases of diabetes. Type 1 is sometimes referred to as “childhood onset diabetes” because it is frequently recognized early on, though it still can develop later in life. While both types of diabetes involve high blood sugar levels, the origins of the high blood sugar are different. Type 1 diabetes is an autoimmune disease that attacks the pancreas, causing it to stop producing insulin. Without insulin, sugar from the food you eat cannot get into body cells and be used for energy. Because of this, type 1 diabetics must take shots of insulin with meals in order to survive. 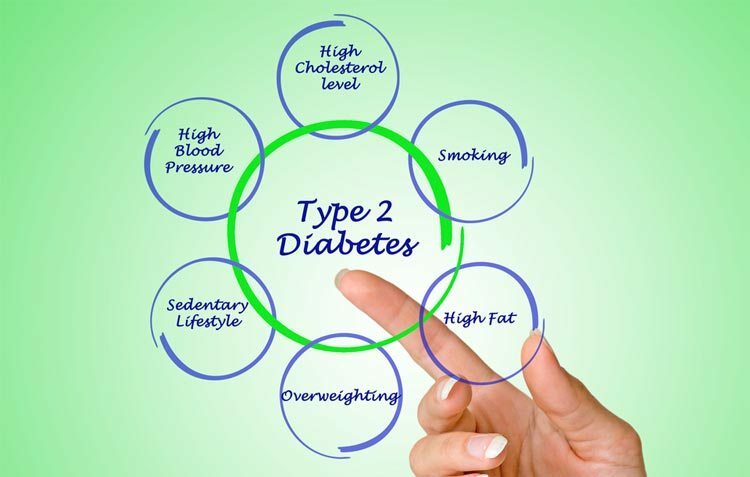 In type 2 diabetes, the condition results from the body’s ineffective use of insulin, and generally comes down to one of, or a combination of two things – insulin resistance or pancreatic function decline. Insulin resistance is when your body's cells don't respond to the hormone insulin. Insulin is the key that unlocks cells so that glucose from the bloodstream can enter. 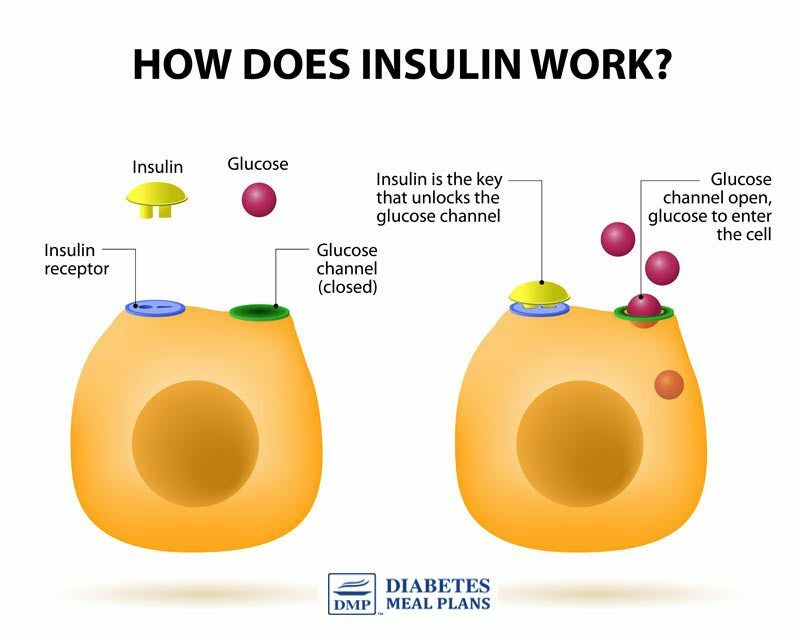 Unlike people with type 1 diabetes who cannot produce insulin at all, with type 2 diabetes your pancreas may still be producing enough insulin, but the insulin is pointless if the cells cannot utilize it and allow sugars to enter the cells. This is unfortunate because it causes the pancreas to produce more insulin (hyperinsulinemia), which increases insulin resistance. Type 2 diabetes is typically considered to be a lifestyle-related chronic disease, because acquiring an active lifestyle and a healthy diet can increase insulin sensitivity and assist with blood sugar regulation. Of course, a healthy diet and lifestyle is also equally important for people with type 1 diabetes. Having one or more of these risk factors can greatly increase your chance of developing prediabetes or type 2 diabetes. And while you can’t change your genetics or your family history, there are a lot of things you can do to lower your risk. If you are living with uncontrolled diabetes, which means your blood glucose levels are outside of the healthy range, then you are at higher risk for some of the more frightening complications of diabetes. Having chronically high glucose levels can lead to more severe health problems (due to the effects of high blood glucose on blood vessels), which may affect your limbs, your internal organs, and even your eyes. The list below shows some of the possible complications of diabetes and their prevalence among diabetics over the age of 20. These complications range from mild chronic pain to life threatening conditions like heart disease, heart attack and stroke. And all these complications can decrease your quality of life. Because of this, getting diagnosed as early as possible and making appropriate lifestyle changes (including starting a low carb diet) are all vital to living a healthier, happier life. It is estimated that 8.5% of the world’s population is diagnosed diabetes, type 1 and type 2 collectively. This equates to roughly 1 in 11 people! The number of people living with diabetes has risen from 108 million (in 1980) to 422 million (in 2014). Interestingly, researchers once predicted that we'd reach 400 million with diabetes by 2025, but clearly we have well exceeded this number already (being 2017 at the time of writing this). According to the International Diabetes Federation, it is now estimated that over 640 million will have diabetes by 2040. The prevalence of type 2 diabetes is currently on the rise in low and middle-income countries as these regions adopt the typical Western diet and lifestyle. Type 2 diabetes was previously known as “adult onset diabetes,” but sadly, now approximately 24% of youth have a diabetes diagnosis. 30.3 million people (9.4% of the population) have diabetes, only 5% of this statistic are for people with type 1 diabetes. An estimated 7.2 million people are currently undiagnosed and going untreated. 25.2% of people with diabetes in the US are over 65 years. An estimated 33.9% of US adults have prediabetes (reported in 2015), 36.6% men, 29.3% women. It is currently estimated that 3.5 million people in the UK have diabetes. Additionally, it is estimated that 549,000 of people are undiagnosed, raising the estimate to over 4 million cases of diabetes in the UK. This equates to 6% of the population, or 1 in every 16 people – 56% men/ 44% women. Around 1.7 million Australians have diabetes. Currently, 280 new cases of diabetes are diagnosed with diabetes every day, which equates to one person every 5 minutes. 3.4 million Canadians (9.3% of the population) are living with diabetes, as of 2015. By the year 2025, that number is expected to rise to 5 million people (12.1% of the population). That's a diabetes prevalence increase of 44% in just 10 years! The estimated number of people with prediabetes is 5.7 million (22.1% of the population). According to the International Diabetes Federation, 69.1 million cases of diabetes were reported in India in 2015. This number equates to a prevalence rate of approximately 8.7% in adults. A 2016 report from the World Health Organization found that about 110 million people in China are living with diabetes. This equates to the highest prevalence rate out of all the countries above, coming in at 10% of all adults. This number is expected to rise to 150 million by 2040. Like many other chronic diseases, ethnicity may play a role in promoting increased risk of developing diabetes, particularly type 2 diabetes. 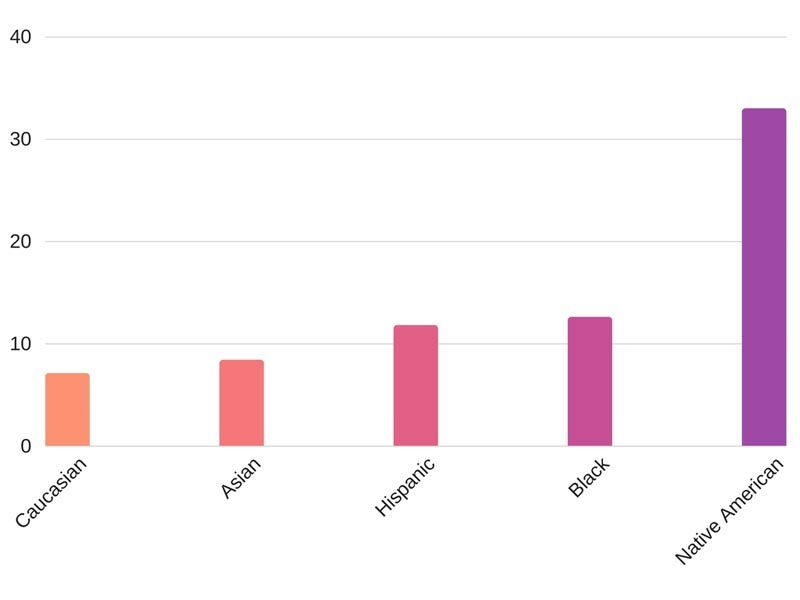 These stats clearly show that, among the U.S. population, Native Americans have a much higher prevalence of diabetes than any other ethnic group. Similarly, the Indigenous peoples of Australia are three times as likely as non-Indigenous Australians to have diabetes (11% compared to 3%). And in the UK, the prevalence of diabetes is 6 times higher for people of South Asian origin and 3 times higher for those of African origin. Why are rates of type 2 diabetes disproportionately higher among Native and Indigenous people or certain ethnic groups? There is no single reason behind this spike in chronic illness among certain groups, but it is likely a combination of genetic, cultural, socioeconomic, historical, and lifestyle factors. However, belonging to certain ethnic groups are not the only risk factors that may increase your chance of developing type 2 diabetes (see the above list of risk factors). Maintain an active lifestyle – aim for 30-60 minutes of physical activity most days of the week. Eat a healthy diet that is high in fresh vegetables and low in sugar and processed foods – a high fiber, low carb diet, such as the diet we encourage here at DMP, is a great dietary pattern to assist with type 2 diabetes management and prevention. Reduce daily stress and find relaxing activities that you enjoy. Get adequate sleep and practice self-care in times of stress and illness. Spend quality time with friends and family. Lose weight if you need to, aiming for a healthy Body Mass Index (BMI). Weight loss is an important factor when it comes to both diabetes treatment and prevention, as research shows a strong link between obesity and type 2 diabetes. Obesity often kick-starts a cycle of inflammation and metabolic dysfunction, which leads to insulin resistance and, eventually may result in a diabetes diagnosis. So, managing your weight can be an important first step in putting out the “fire” of systemic inflammation. Research has also discovered that 85% of children with type 2 diabetes are clinically overweight or obese, so encouraging a healthy lifestyle from a young age may secure a healthier future for your kids. As DMPs founder and leading nutritionist, Jedha is on a mission to empower the lives of people with type 2 diabetes and prediabetes by providing evidence-based nutrition and health education, along with practical tools to obtain better health. With a professional background in the health industry spanning more than 15 years, Jedha has authored hundreds of educational articles across print and online publications worldwide, has been published in the Journal of Nutrition & Intermediary Metabolism, and has helped transform the lives of thousands.